Hair accessories help accentuate a woman’s hair. Explore this write up for popular women’s accessories. Whether you sport long hair or short hair, you can add a chic look to your style by wearing matching hair accessories. If you are tired of wearing the same haircut, and if you do not wish to go for a haircut or color your hair, just try any of the cool women’s hair accessories available. Just add a flower, a headband, or cute clips and voila, you just created a new style for yourself. There is absolutely no necessity to spend long hours in your hairdresser’s seat, anymore. There are plenty of natural looking hair accessories available for women that you can pair with your dress and wear for evening parties, work, or just while running on daily chores. Hair accessories also help tame your hair and keep that unmanageable frizzy hair away from your face while doing work. There are a wide range of hair accessories available in the market today so you can choose the one that fits perfectly to your style. Different hair accessories are available for baby girls as well. Headbands and hairclips are the most common hair accessories for kids. If you want to know more about popular hair accessories for women, read the sections below. Headbands are the most popular hair accessories for women. Headbands have been in fashion for a long time. This accessory looks cute on babies as well as on adults. Whether you sport a short hairstyle or a long hairstyle, headbands can be worn for any occasion. In addition, headbands help to hold back your hair firmly. Headbands are available in different materials and styles. If you need to hold your hair firmly for a long time without adjustments, use the ones that come with in-built combs. Headbands with embellishments also look cute on young girls. Hair extensions are the most popular hair accessories among women. This helps you to experiment with different hair color, without actually coloring your hair, and try different hairstyles, without getting a haircut! If you sport a short hairstyle, use hair extensions to make your hair look long. Hair pins are very handy to hold your hair in place. Hair pins are available in different colors, shapes and sizes, so you can match them with your outfit and wear them. Hair pins can be studded with colored stones, made of plastic or decorative wires. If you have nice hair bangs, secure you hair partially with hair pins so that your bangs get highlighted. If you have long hair, with decorative hair sticks you can create your own style. Beautiful hair sticks are available in bright colors, studded with pearls, and fine water stones. Weave your cascade in a soft bun and secure it with a nice decorative hair stick for a smart and elegant look. 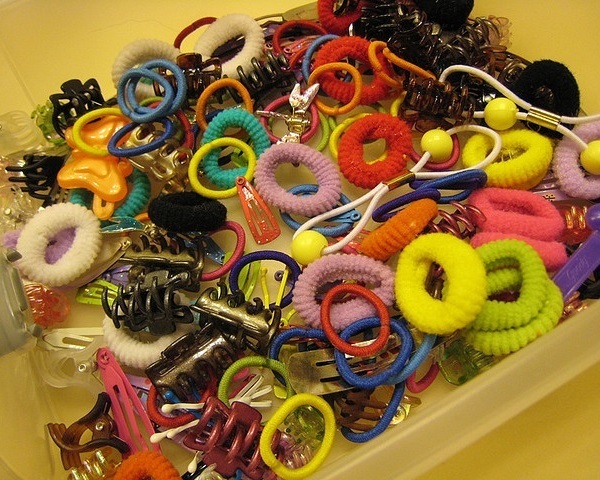 Hair clips are also known as ‘barrette clips’ and are one of the most common hair accessories for women. Hair clips can be worn with any kind of outfits, casual or formal. They help you to updo any kind of hairstyles, be it a French roll or just a casual bun. Hair clips also help to create your own hairstyle. Hair scarves are cool hair accessories that were highly popularized by Marilyn Monroe. You can wear matching hair scarves with your attire and create your own fashion statement. Hair scarves are available in different fabrics and different colors.